Ocular surface squamous neoplasia (OSSN) includes a wide spectrum of conjunctival and corneal intraepithelial neoplasia. The lesions may vary from mild dysplastic changes to dangerous invasive squamous cell carcinoma (SCC). Early manifestations are small masses at or around the limbus mimicking pterygia, occurring in middle-aged patients. However, their potential for malignancy is quite high, and hence, the early diagnosis assumes greater significance. It was Lee and Hirst who coined the term OSSN. The two major risk factors are ultraviolet-B light and human papillomavirus (HPV). A number of studies have been successful in detecting HPV Type 16 and 18 in OSSN. Other reported risk factors include exposure to petroleum products, heavy cigarette smoking, chemicals such as trifluridine, arsenicals, beryllium, ocular surface injury, Vitamin A deficiency, light pigmentation of hair and eye, defective DNA repair in xeroderma pigmentosum, family origin in the British, Austria, or Switzerland, infection with HIV, and other immunocompromised states. OSSN occurs in the sun-exposed areas of the conjunctiva at the limbus in elderly individuals. Excessive exposure to ultraviolet light causes DNA damage. Failure of DNA repair leads to the formation of carcinoma. The average age of presentation is usually in the sixth and seventh decades. The p53 gene is a common cellular target in human carcinogenesis and is thought to have an important role in cellular proliferation. OSSN is a slow-growing tumor of low-grade malignancy, which rarely metastasise. OSSN can be classified as preinvasive lesions and invasive SCC. The preinvasive lesions are again classified as mild, moderate, and severe dysplasia depending on the degree of involvement. Mild dysplasia involves the lower third of the epithelium, moderate dysplasia extends into the middle third, and severe dysplasia refers to the full-thickness involvement. Invasive OSSN or SCC shows nests of neoplastic cells that have penetrated the epithelial basement membrane and spread into the underlying stroma. Tumor cells may be well-differentiated or ill-differentiated. Two types of cells may be seen interspersed along with squamous cells – spindle cells or mucoepidermoid cells. The latter is notorious for intraorbital extension as well as early recurrence if left untreated. Egbert et al. first introduced impression cytology into ophthalmology in 1977. They used cellulose acetate filter paper. Thiel et al. described the use of Biopore membrane. Hatchell and sommer suggested that impression cytology could be used for early detection of Vitamin A deficiency. Nolan et al. 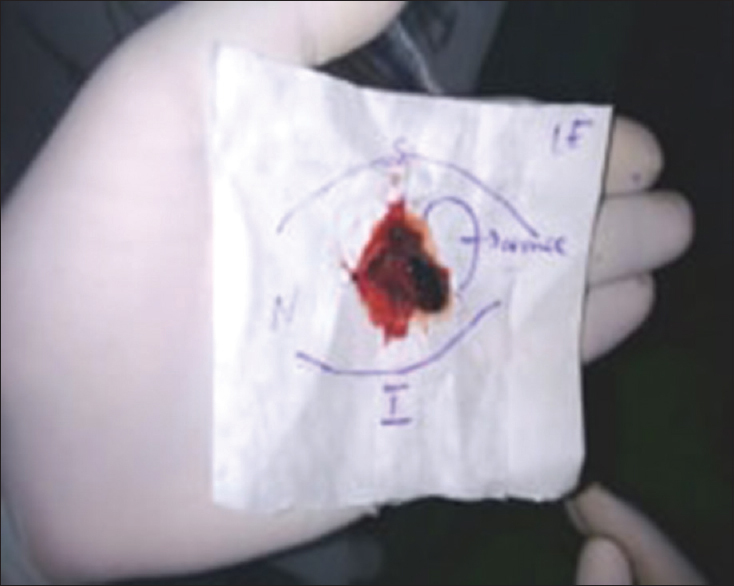 first reported application of impression cytology using acetate filter paper for the diagnosis of conjunctival neoplasia. Tseng has done staging of conjunctival metaplasia by impression cytology in 1985. Tole et al. studied the reliability of impression cytology for the diagnosis of OSSN employing the Biopore membrane. Impression cytology has been found to be useful in assessing the ocular surface in various dry eye disorders such as keratoconjunctivitis sicca, ocular pemphigoid, Vitamin A deficiency, and ocular squamous neoplasia. Patients with elevated conjunctival limbal lesions accompanied by feeder vessels were included in the study. Patients with extensive involvement, patients with exclusive corneal involvement, and patients with recurrence were excluded from the study. Complete slit-lamp examination was done to describe the extension of the lesion, presence of any feeder vessel, or pigmentation following which all cases were subjected to impression cytology [Figure 1]. In this technique, cellulose acetate filter paper was used and it was pressed firmly against the lesion for about 5–10 s after instilling 4% xylocaine drops. The smear was made on glass slide using filter paper. The slide was fixed with 100% isopropyl alcohol for half an hour. After staining with hematoxylin and eosin, slides were studied under light microscope by a single pathologist. Slides were observed for the presence of dysplastic cells, inflammatory cells, and hyperkeratosis. Tumor resection was performed under local peribulbar or retrobulbar anesthesia, using a 1:1 mixture of 2% lidocaine and 0.75% bupivacaine. Phenylephrine 2.5% drops to induce vasoconstriction. After outlining the borders of the tumor, 4-mm margins are marked with the help of calipers at the scleral edges. The conjunctiva is lifted with forceps, and the first incision was made with a pair of Westcott scissors. Alcohol kerato-epitheliectomy was done on the corneal side. Initial tumor dissection is localized to the marked margins, and any contact of the tumor with the surgical instruments was avoided to stop tumor seeding. After completion of the dissection of the peripheral marked margins, the dissection was directed towards the centre of the tumor. In the event of tumor adherence to the sclera, a partial thickness sclerectomy is performed with a blade and forceps. Following this, double freeze-thaw cryotherapy of the margins was done. Amniotic membrane grafting was done for better healing. Once the lesion is removed en bloc, the specimen was marked in the proper orientation with sutures and then transferred to a piece of pencil-marked cardboard. The specimen was sent to pathology in formalin [Figure 2]. For larger lesions, chemoreduction was done with mitomycin c. [Figure 3] shows Preoperative and postoperative pictures. Cytology and histopathology reports were compared. The presence of dysplastic cells in impression cytology and neoplasia in histopathology was considered as correlation. 42 patients were included in this study. Out of 42 patients, 23 (54.76%) were males and the remaining 19 (45.23%) were females [Figure 4]. Five patients (11.90%) had SCC. 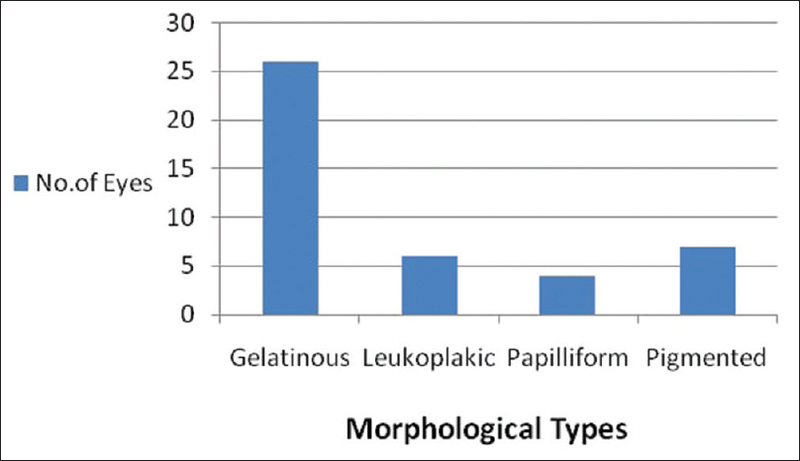 According to morphology, [Figure 5] gelatinous type constitutes 60.46%, leukoplakic – 13.95%, papilliform – 9.30%, and pigmentary – 16.27% [Figure 6]. One patient (2.38%) had bilateral presentation [Figure 7]. Four patients (9.52%) were found to have HIV infection. Impression cytology refers to the application of a cellulose acetate filter to the ocular surface to remove the superficial layers of the ocular surface epithelium. These cells can then be subjected to histological, immunohistological, or molecular analysis. Proper technique is essential as the number of cells sampled can vary considerably. In general, two to three layers of cells are removed in one application, but deeper cells can be accessed by repeat application over the same site. Applications for impression cytology include diagnosing a wide range of ocular surface disorders, documenting sequential changes in the conjunctival and corneal surface over time, staging conjunctival squamous metaplasia, and monitoring effects of treatment. 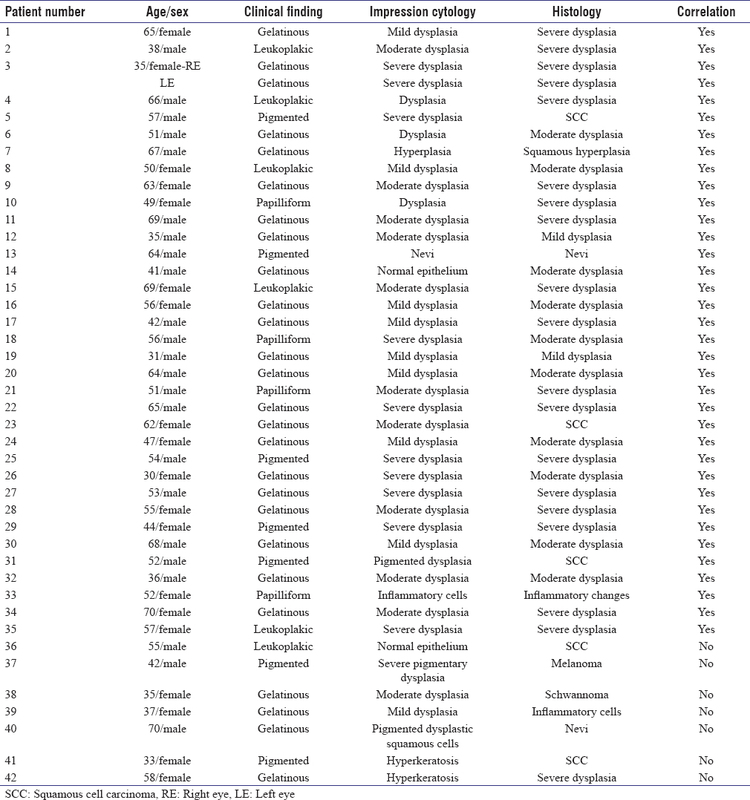 In this study impression, cytology and histopathology had correlation [Figure 8] in 36 eyes [83.72%] [Table 1]. The remaining 7 (16.27%) eyes had no correlation [Figure 9]. False negatives: 3 – However impression cytology failed to diagnose dysplastic cells in the hyperkeratotic lesions. Statistical indices were calculated [Table 2]. The positive predictive value of this cytological test is quite high which was about 89.74%, and the sensitivity was about 92.11%. In our study the accuracy was 83.72% [Table 3] when Compared with other similar studies. Impression cytology is a simple, noninvasive technique with a high correlation rate in the diagnosis of OSSN. It can be used as a routine investigation in patients with suspected OSSN. It is especially useful in patients with suspected recurrence following excision biopsy. Impression cytology has reasonably good accuracy. It has a definite role for the follow-up of lesions, after primary treatment, whether surgical or topical chemotherapy. Major ophthalmic centers should develop and introduce this technique into routine clinical practice. This is best achieved with a team approach including the ophthalmologist, pathologist, microbiologist, and the immunologist. However, histopathology remains the gold standard investigation for the diagnosis of OSSN. Tulvatana W, Bhattarakosol P, Sansopha L, Sipiyarak W, Kowitdamrong E, Paisuntornsug T,et al. Risk factors for conjunctival squamous cell neoplasia: A matched case-control study. Br J Ophthalmol 2003;87:396-8. Mittal R, Rath S, Vemuganti GK. Ocular surface squamous neoplasia – Review of etio-pathogenesis and an update on clinico-pathological diagnosis. Saudi J Ophthalmol 2013;27:177-86. 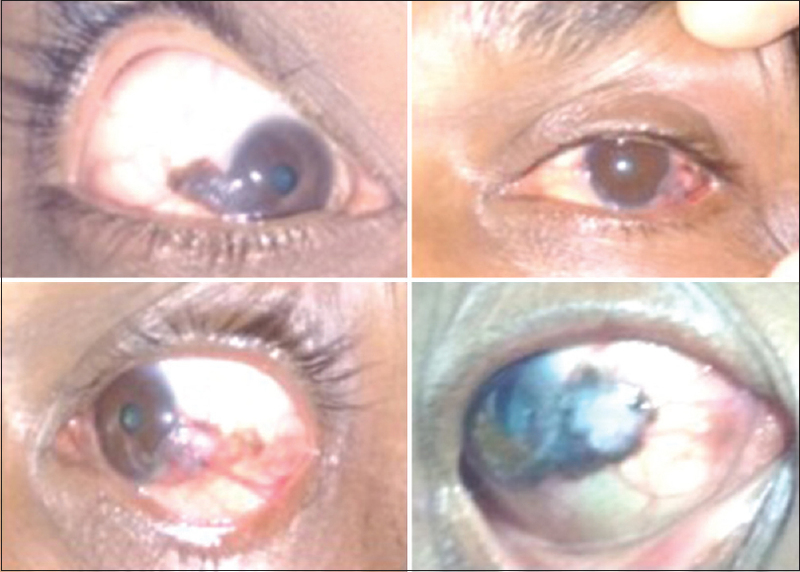 Anil Radhakrishnan MS. Ocular surface squamous neoplasia [OSSN] – A brief review. Kerala J Ophthalmol 2011;xxiii:347-51. Egbert PR, Lauber S, Maurice DM. A simple conjunctival biopsy. Am J Ophthalmol 1977;84:798-801. Thiel MA, Bossart W, Bernauer W. Improved impression cytology techniques for the immunopathological diagnosis of superficial viral infections. Br J Ophthalmol 1997;81:984-8. Hatchell DL, Sommer A. Detection of ocular surface abnormalities in experimental Vitamin A deficiency. Arch Ophthalmol 1984;102:1389-93. Nolan GR, Hirst LW, Wright RG, Bancroft BJ. 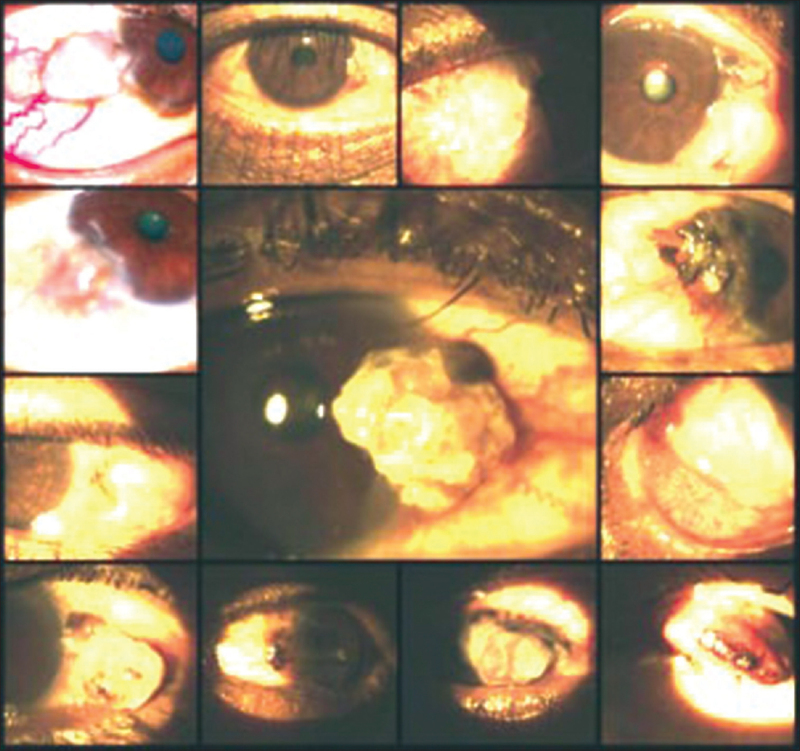 Application of impression cytology to the diagnosis of conjunctival neoplasms. Diagn Cytopathol 1994;11:246-9. Tole DM, McKelvie PA, Daniell M. Reliability of impression cytology for the diagnosis of ocular surface squamous neoplasia employing the biopore membrane. Br J Ophthalmol 2001;85:154-8.